Yet even when the various aspects of instant city can be named, through its own art and means, this music building game automat brings a dynamic impulse into space that is new and whose true quality has over and over again approved. 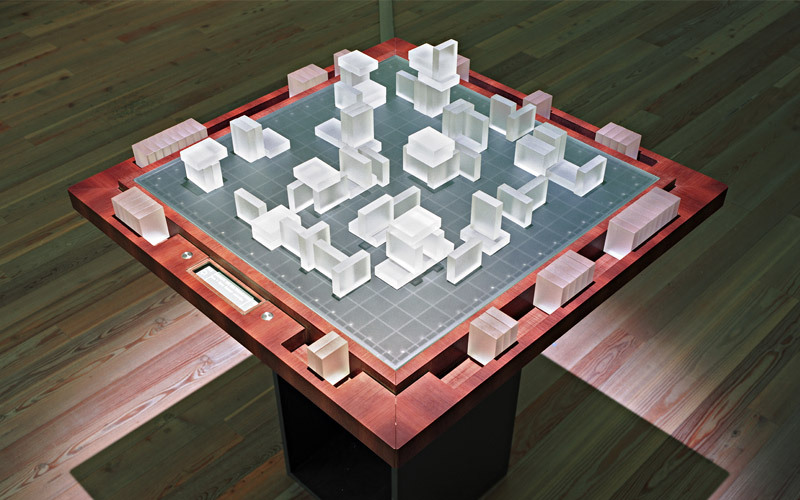 One or more players at a table can create architecture using semi-transparent building blocks and in the process make different modular compositions audible. Every performance is unique because the sequence, timing and combination possibilities are completely in the hands of the players! For each game one composition is chosen. To date, ten different musicians have each produced special compositions which serve as the basic music building kits of instant city. Every game that is started here follows its own unique, unrepeatable course. 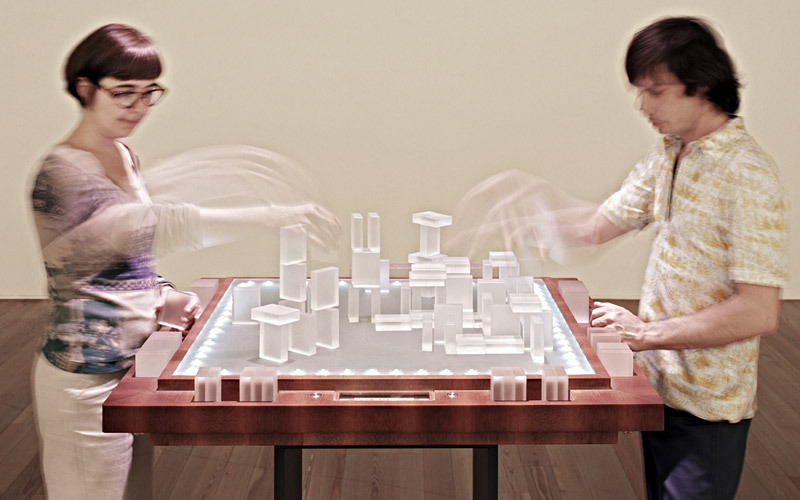 The playing and what the game triggers are completely different from person to person. Some would like to walk away after only a short time, overwhelmed by the limitless possibilities. Others would like to loose themselves in the game. Perhaps mathematically oriented players will try to proceed strategically through decoding reaction patterns. Esthetes might aim to create especially elegant constructions – and allowing the musical effect to retreat into the background. Musically inclined players might try to coax as much music as possible out of these “automatons”. The approaches to the game and the possible outcomes are limitless. different personality structures do. Suddenly there could be leaders who want to build up high – or saboteur whose structural intention is to disrupt or destroy. The music suddenly plays the role of a commentator or also a referee, who through sounds remarks upon the single acts. 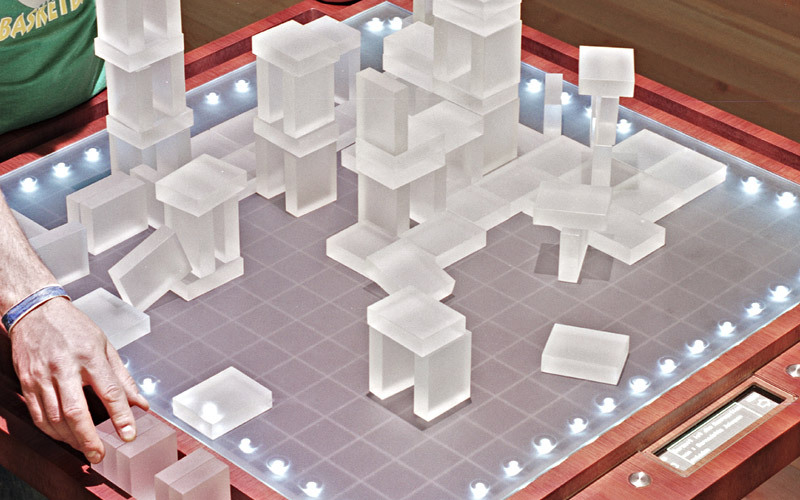 With instant city an “instrument” has been created that can enliven a space and the events in it on a variety of levels.